Pick up your rental car at the Airport. Explore Vancouver one of the most spectacular cities in the world. The North Shore, home of Capilano Suspension Bridge and Grouse Mountain, for panoramic views over the city are also highly recommended. Travelpack recommends: Deluxe Vancouver City Tour Experience Vancouverâ€™s charm. See Canada Place, Robson Street, Chinatown and Gastown. Soak in the natural splendor of Stanley Parkâ€™s Totem Poles and Prospect Point. Pass the West End high-rises and the beaches of English Bay on our way to vibrant Granville Island with its public market, shops, restaurants and galleries. Your journey will take you through the fertile farming region of the Fraser Valley through to Summerland. The town centre is situated in a flat area above Okanagan Lake with fertile valleys defined by forested ridges. Giantâ€™s Head Mountain, an extinct volcano, dominates the skyline. Orchards and vineyards surround the town, filling the flat lands, the steep narrow gulches that run down to the lake and the broad valleys that radiate to the west. There are different routes you may take today; either back track to Hope and take the Canyon Highway or via the small towns of Keremeos to Hedley. In Hedley you could make a stop to visit the Mascot Gold Mine tour. Then through Penticton for a leisure stop at Okanagan Lake and on through Merritt to the Village of Ashcroft. Riding at the Sundance Guest Ranch is included. 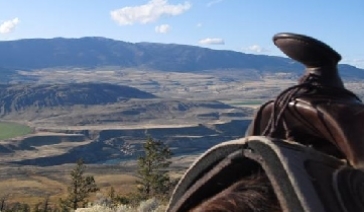 Each group of riders is accompanied by an experienced wrangler, who will give you all the instruction you need to make your horseback experience safe and fun. Today you will travel north to Williams Lake and then west on Highway #20. In Riske Creek turn left drive on Forestry Road #2000, via Farewell Canyon. Our first â€œBig Creek Lodgeâ€ sign is in Big Creek on the main road. You also may drive via historical Leeâ€™s Corner. There are signs in Hanceville on Highway #20 to Big Creek and to the Big Creek Lodge all along the road. The possibilities of things to see and do in the Chilcotin are almost endless. Today you will head through Tweedsmuir Provincial Park to Hagensborg a Norwegian settlement located in the Bella Coola Valley and is home to nearly half the valleyâ€™s residents. Close to popular fishing areas. The Atnarko and Bella Coola Rivers are classified as â€œHeritage Rivers of British Columbia.â€ These ancient and magnificent watersheds are world famous for salmon fishing and have been used for thousands of years for food fishing and travel corridors. If you have never experienced a river drift you are missing one of the most awe-inspiring ways to see the Bella Coola Valley in all its splendor. Sail direct from Bella Coola to Port Hardy. Youâ€™ll get a good look at the scenic Dean Channel during daylight hours if you board the ferry in Bella Coola for the southbound sailing. Although Natives have inhabited the area for thousands of years, the inhospitable terrain has limited development and exploration by European settlers until comparatively recently. Wildlife viewing - the ferry slows for orcas, another bonus of this trip. Today you will head south on Island Highway 19 to Telegraph Cove, the tiny town is a major destination during the summer months, when the snug little bay bustles with boaters, anglers, campers, kayakers and whale-watchers. Continue towards Courtenay located in the heart of some of the most beautiful farming landscape on Vancouver Island, Courtenay is the urban centre of the Comox Valley. Travelpack recommends: Whale Watching Cruise From Telegraph Cove cruise the calm, protected waters of Johnstone Strait & the Blackfish Archipelago on the northeast coast of Vancouver Island. This area is acknowledged as the most accessible and predictable location to see Orca (killer whales) in the world. Telegraph Cove is the closest place to this area. This beautiful area is home to a wealth of other marine wildlife as well. This morning you will head for the port of Comox to take the BC Ferries across to Powell River on the Sunshine Coast. Accessible only by ferry, and famous for its provincial marine parks and inviting saltwater inlets. Drive along the coast to the small village of Egmont, dating back to early European settlement and which has an older First Nations history. Tucked amidst majestic cedars and firs with spectacular views of the Pacific Coast, experience fine dining and adventures in the wild. parking lot to this spectacular sight. You may also wish to try some of the activities offered by the lodge (additional cost): sea kayaking, fishing, canoeing, heli hiking, hiking, mountain biking or a boat tour to Princess Louisa Inlet. Today continue south to the ferry terminal at Langdale with convenient 40-minute sailings every two hours, seven days a week you will cross over to Horseshoe Bay. Here you may wish to take a Sea Safari to explore Howe Sound. 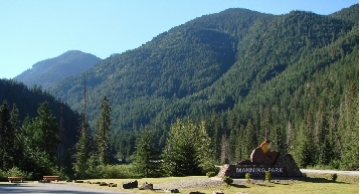 Once you are ready to leave Horseshoe Bay you will travel north on the Sea-to-Sky Coastal Highway to Whistler. A Guided Nature Tour. Discover spectacular Howe Sound, for a 2 hour adventure to the spectacular scenery and wildlife which make coastal British Columbia world famous! Points of interest are Pam Rocks, a Harbour Seal haulout, normally complemented by majestic bald eagles soaring overhead. Cruise out into The Strait of Georgia to see awesome views of Vancouver and spectacular waterfront homes. Spend the day in Whistler, home to the 2010 Winter Olympics. The Whistler area offers numerous outdoor activities such as hiking, mountain biking, ATV, golf, rafting, horseback riding, etc. For the adventurous, Ziptrek offers a thrilling treetop â€œzip lineâ€ adventure. Or take the gondola to the top of Whistler Mountain for stunning views of the area. Time for some last minute shopping in Whistler before returning towards Vancouver and the airport for your flight home. Car Hire:Â Check out our car hire rates.